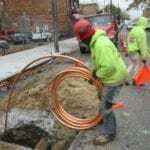 Have you recently experienced a backup of your sewer line and not sure why? 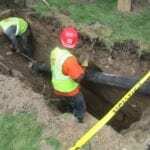 There are several reasons why you would experience a sewer line stoppage. Tree roots, a cracked or broken pipe and an obstruction inside of the pipe are the most common factors leading to sewage on your basement floor. 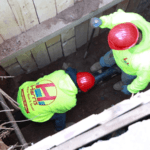 It is very important to obtain a thorough analysis from an experienced and licensed plumber, before determining the exact nature of your sewer problem. Many plumbers are quick to diagnose a pipe to be broken when in all actuality; there is a more simple and cost effective way to resolve the problem. It is quite often that a plumber will tell the homeowner that the pipe is broken to create a larger, and more profitable job than required. For this reason it is important to make sure your plumber is licensed and accredited with the Better Business Bureau. 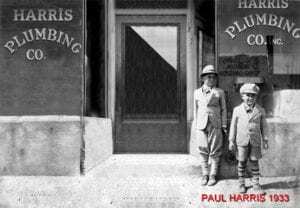 A homeowner had one of the most well-known plumbing & drain cleaning service at his house after experiencing a sewage backup in his basement apartment. The drain cleaner pulled roots out of the sewer line and performed a video inspection right in front of the homeowner. 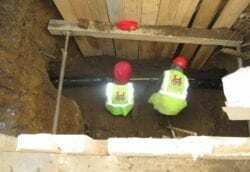 A sewer video inspection is not easy to diagnose unless you have experience and know what you are looking for, this plumber was well aware and decided to take advantage. 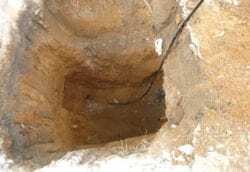 He told the homeowner that the sewer line on the property was in decent condition, and the pipe from the sidewalk to the city sewer was completely collapsed. He charged the customer $1,300 for the video inspection and gave him a price of $11,000 to replace the sewer pipe in the roadway. In all actuality, the video showed the exact opposite. The pipe was in perfect condition in the roadway and was in terrible condition on his property. This plumber had an ulterior motives! Even though in a desperate situation, the homeowner wisely decided to obtain a few other quotes before hiring a company. 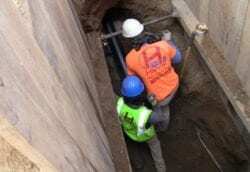 He told the other water main and sewer contractors exactly what was told to him, “The pipe in the roadway is completely collapsed and I saw the video to prove it”. 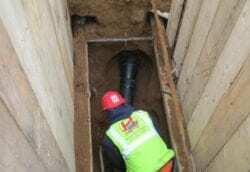 Naturally, all of the contractors provided a price for the sewer line repair in the roadway. Harris Water was hired to replace the pipe, after digging 11’ deep in the roadway they finally reached the “collapsed pipe”. The pipe was not separated at all; it was not in the best condition, but there was no need to replace the pipe on an emergency basis. The other plumber was planning on keeping this from the homeowner and selling him on replacing the property pipe once they had already started the job. At this point most homeowners feel they have no option but to continue with the contractor who started the job. Harris ended up changing the pipe as per contract after discussing with the homeowner, as well as providing video, pictures and a written letter as evidence. The homeowner ended up having the other plumber replace the pipe on his property free of charge, as well as learning a huge lesson when dealing with unethical contractors. 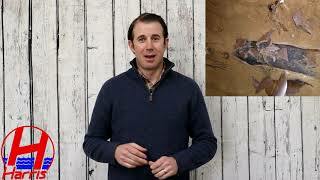 A homeowner was in a desperate situation after returning from a one month vacation. He quickly became aware that his tenants had not been able to use any water in the house due to severe sewer backups in the house. This homeowner acted out of desperation and hired a friend, of a friend to replace the pipe under his sidewalk. In this case the plumber was accurate; the pipe was broken on the sidewalk but was not the only break throughout the sewer line. The plumbers snake could not get through this point to determine a secondary break; this was the least of the homeowner’s problems. As the “plumber” was digging up the sidewalk by hand, the DOT (Department of Transportation) decided to perform a random check for required permits. The plumber was not licensed and immediately fled the scene. The homeowner was not able to get in touch with the plumber, was out $6,000 and still had a broken sewer line. Harris Water was hired to finish the job after obtaining all required permits from DOT, DEP and the Parks Dept. for a nearby tree. 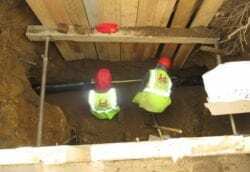 Harris advised the homeowner to assume no more risk and replace the entire pipe from the sidewalk to the city sewer in the roadway. This was going to cost the homeowner a few more dollars and more importantly, avoid any surprises with future breaks in the roadway. 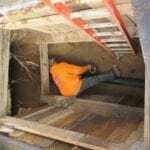 Note- If a plumber is digging by hand for a sewer installation on city property; it is safe to assume that something is not right. 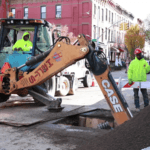 A sewer installation requires heavy machinery such as a backhoe, and dump trucks for carting debris. 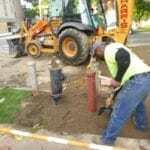 Always make sure to research a water main and sewer contractor before hiring, signing a contract and giving a deposit. 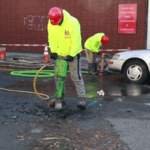 There are only a select group of contractors throughout the five boroughs of NYC who hold the required license, insurance and bond with NYC to perform a water main or sewer installation.